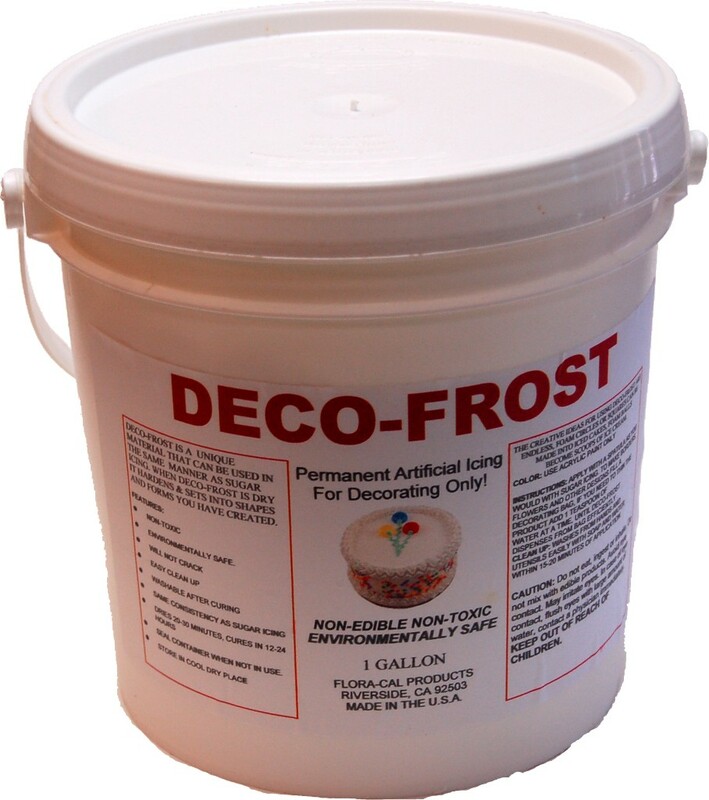 Deco-Frost 1 Gallon Artificial Non-Edible Fake Icing. DO NOT MIX WITH EDIBLE ICING. Deco-Frost is a unique material that can be used in the same manner as real icing, when Deco-Frost cures it remains flexible unlike royal icing that is brittle. The Creative Ideas for using Deco-Frost are endless, foam shapes can become artificial decorated cakes, Deco-Frost can be hand piped just like real icing. Color: Use Acrylic Paint ONLY. Apply with a spatula as you would with roral icing, to make borders, flowers and other designs use a pastry bag and your choice of tip. To thin Deco-Frost add 1 Teaspoon of water at a time until the correct viscosity. Clean Up: Clean utensils and pastry bags with soap and water. WARNING: Do not eat, ingest or inhale. Do not mix with edible products. Avoid eye contact. May irritate eyes. In case of eye contact, flush eyes with large amount of water, contact a physician immediately. KEEP OUT OF REACH OF CHILDREN.